* This review contains spoilers for the previous book, Soulless. To Sum It Up: Lady Alexia Maccon, recently appointed to the Shadow Council by Queen Victoria, has a new mystery on her hands. Something with the power to cancel out the abilities of the supernatural, the very thing that Alexia herself is capable of, has swept through London. Even more concerning for Alexia, this unknown threat seems to be headed in the same direction as Lord Maccon, who has suddenly taken off for Scotland on pack business. So Alexia is off to Scotland, too, most reluctantly accompanied by her lovelorn best friend and petulant half-sister. Review: With all of its acerbic wit, lovably quirky characters, Victorian England setting, and explosive chemistry between preternatural Alexia and werewolf Lord Maccon, Soulless became an instant favorite of mine. I was desperate to get my hands on Changeless, but fate was a bit cruel and made me wait five days for a copy to arrive. In the meantime, I tried to retain my sanity because I needed to read this so badly. I love the writing style of this series so. Much. I’d be perfectly happy talking all proper-like all the time if only everybody else wouldn’t think I’d gone completely batty. The prose certainly give the books an irresistible charm but without coming off as gimmicky. Seriously, I can’t read enough of it. Our indomitable heroine Alexia, now Lady Woolsey, acquits herself splendidly once again. She’s armed with an upgraded parasol that’s more lethal than any parasol she’s carried in the past, which is a necessity for someone who flirts with danger as often as Alexia does. In this installment, she can’t even enjoy a nice dirigible ride to the Highlands of Scotland without running into trouble. Of course, so much of the fun in reading about Alexia’s adventures is waiting to see how she’ll manage to escape her latest scrape. 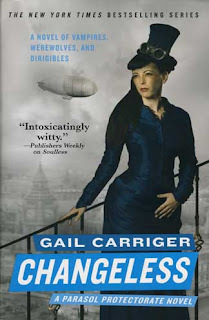 The steampunk gets turned up a few notches in Changeless, especially with the introduction of Madame Lefoux, inventor extraordinaire. It’s Madame Lefoux who, at Lord Maccon’s request, outfits Alexia’s new parasol with all sorts of ingenious weaponry. There’s also quite a lot of intricate detail, and maybe just a mite too much, about the aethographor, kind of the steampunk version of the telegraph. Overall, though, the technology of this world is fascinating and only one of the many reasons why I wish I could live in it. One nitpick that I have about Changeless is how minimally some of my favorite characters from the first book appear in it, like Professor Lyall, Lord Akeldama, Biffy, and Floote. Even Lord Maccon is off-page for a while, much to my dismay. I also must vent my feelings over the ending of Changeless: NOOOOOOOO!!!! I’m rather peeved at a certain character right now. I shall, however, put all my faith in Gail Carriger to set all to rights with the next book, which I am very happy to report I have on hand so as to avoid another horrible delay in continuing this wonderful series. All in All: Changeless is a very good sequel and earns bonus points for traveling to the Scottish Highlands amidst my current Outlander obsession. I confess to enjoying Soulless a tad more, but I am still wholly in love with the Parasol Protectorate series as a whole. I'm so bummed I didn't get approved for Prudence!!! great review, Lee, so glad you're not only enjoying the series but steampunk as well. I'm upset on your behalf that you didn't get approved for Prudence! Bah! I am loving this series. It's been a great way to start off a new year of reading!